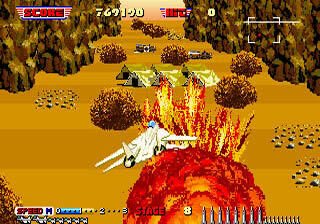 I remember being blown away with the outright speed and explosive zeal from Sega’s Afterburner back in 1987, in the arcades. While finding sit-down versions of this game were next to impossible, that was pretty much fine by me, as I preferred the stand-up cab. 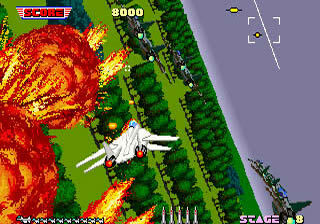 Ever since then, I’ve compared Afterburner to just about every 1st/3rd person fighter plane game there is. 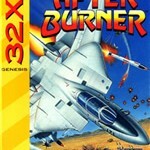 When the 32X was released, I recall thinking how appropriate if it would be if Afterburner were released on it. From rumors to truth, a 3rd party developer was in fact developing a port. YES!!! 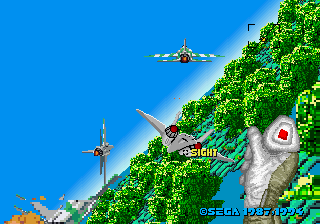 After the blue SE…GA logo is displayed, AFTER BURNER spins around and the balls outlining the II symbol spin silently on the title screen. Pressing start blares out the familiar and arcade-perfect “coin has been inserted” sound effect (cue giddiness). Rhythm synth guitars chug out the Afterburner anthem, making you aware that the game is ready to be played zealously. Either stare at the trademarked and perfectly scaled and rotated colored balls spin around, or wait for the digitized graphic “how to play” screen show you where the missile and vulcan cannon buttons are located. First things first. The most obvious comment about the graphics to make is the scaling effects. Generally speaking, the scaling is smooth but contains quite a bit of “jitter.” That is, sprites seem to shake as they scale, and can get understandably pixelated. Colors though, are vibrant and accurate to the arcade original. 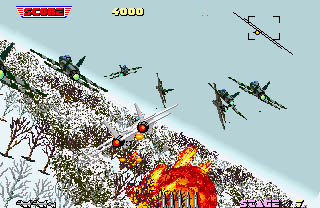 The screen can be loaded with many sprites at any time, with no flicker or slowdown, and should your plane explode in front of you, your screen will be filled with flicker-free explosions. While I don’t know how the audio was sampled from the arcade version, they give me the impression that they are probably very close, if not equal, in quality. Being a video game BGM fan, I do recall how great Sega’s original soundtrack was for this game. All the synth guitars sound great, and all percussion used is clean and real. 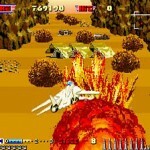 The sound effects compliment the BGM well, and have that typical “arcade” style to them all. Another point to make is that the voices are satisfactory (no scratchiness here!). The vocabulary very much equals that of the arcade version. The options are pretty diverse, and allow you to flip the Y axis (Reverse or Normal), change how the barrel roll operates and how many planes you get between continues, as well as the usual button layout. I find the default layout to work great for me. Double-tapping the <Fast> button enables the afterburner but also by double-tapping any speed button automatically accelerates or decelerates your plane to that preset. Simply holding the button down allows a gradual change in speed. Personally, I find all these options logical and very welcome. Even so, the biggest gameplay difference between Afterburner Complete and Afterburner 2 is how the missile targeting cursor behaves. 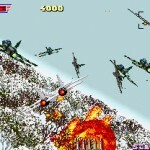 While Afterburner 2’s cursor is rock solid, and possible to hit every plane with a good amount of practice, Afterburner Complete’s cursor hops around like a limp sock. I don’t know which one is proper but expect this to toughen the learning curve for a while. But I am pleased that all the extra missile codes still work during the refueling sequences, and will you need every missile you can get. Barrel rolls are easier, thanks to the option setups. I played Afterburner 2 to death, and I will be honest by saying that this version is much harder. 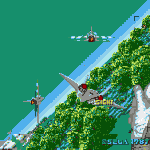 Unlike in Afterburner 2, they have included the “slam-‘n-spin” death. Yeah, you know it…get hit by a missile just right, and your plane spins to a fiery death. I am very glad they included this, as it makes the game more authentic. Bonus rounds are also complete with “real” canyons and “real” radio towers that extend to the top of the screen. 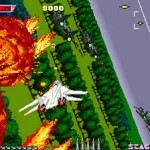 And yes, SEGA’s Hang-On biker and red OutRun car still try to race you in your F14 during the ground refueling scenes. 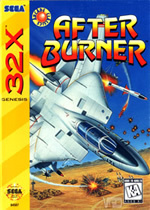 If you like shmups and/or Afterburner, and want a quality title to add to the somewhat meager 32X lineup, this is a game you must buy. Is the best home version of Afterburner you can get. REVO EMAG! It’s very interesting, that the arcade came in 1987 and the most “close to arcade” port of this game came in 1995. It took 8 years to port After Burner in it’s arcade quality to home systems! But A.B. Complete is even better then the arcade version in my oppinion. A++ port of After Burner for the 32x right here. This is what SEGA was talking about when they said they’d be bringing the arcade experience home!